Tracy Higginbotham is the Founder and President of Women TIES (Women Together Inspiring Entrepreneurial Success), a company dedicated to helping women entrepreneurs expand their local, state and regional marketplace in New York State. Tracy believes very strongly in the buying and selling power of women. In 1995, Tracy created her first company—Five Star Events—an events management company which she ran for 15 years. In 2005, Tracy embraced her passion for supporting other women entrepreneurs and created her second company, Women TIES, LLC, in order to create a larger and stronger geographic buying network for women business owners across New York. 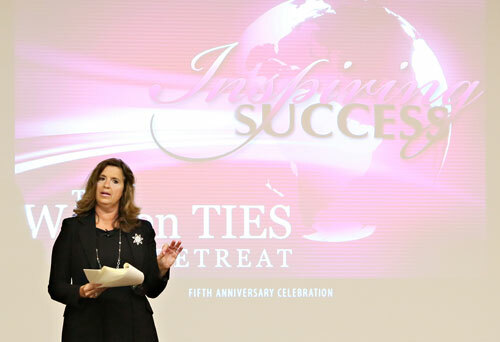 Ten years later, Women TIES has 300 members (local, state, national and even one international member), 60 regional volunteers in six active regional districts and a high success rate of women creating stronger economic connections with each other across the state. Tracy's dedication to supporting women entrepreneurship was recognized by the Small Business Administration twice—once in 2005 and again in 2011 when she received the Region II "Women Owned Business Champion Award." The Women Business Champion award is given to someone for their significant contributions as an outstanding small business person and for dedicated support of small business. Higginbotham has received numerous awards including: the 2015 WCNY "Women Who Make America" Award, 2013 Zonta Crystal Ball Award, Women in Business Award, 25 Women in Leadership Award, the Girl Scouts "The 100" who Inspire Girls to Achieve and Lead, 40 Under 40 Award, and the SUNY Oswego Alumni Association Community Service Award. Higginbotham is an Advisory Board Member of the State University of New York at Oswego School of Business, Board Member of the Upstate Women's Business Center in Utica, Advisory Board Member of Maureen's Hope Foundation, Chair of the Women's Group for Franciscan Northside Ministries and Past Board President of Khoros Performing Arts for Children. She was the columnist of the Syracuse Post Standard's "Ask the Entrepreneur" column for 11 years from 2001-2012. She is also the Past Chairwoman of the 40 Below Emerging Entrepreneurs Program, and Past Public Relations Co-Chair of the Women's Fund of New York. Higginbotham is also a published writer whose inspirational short stories and articles appear in several national publications and books, including the 2009 Chicken Soup for the Soul: Power Moms. Want to Hire Tracy as a Speaker? Would you like to receive Women TIES' weekly electronic newsletter called "Wednesday Wisdom," be notified of new events, services and information from Women TIES? Please provide your name and email address. Your personal information will be kept private and will not be shared with anyone outside of Women TIES.